Just managed to marathon read the whole of the Tower of God series, totalling 218 chapters. This is a Manwha style webcomic and was written/drawn by Lee Jong-hui (aka SIU). And things are getting really interesting right now! Baam (Jyu Viole Grace) has finally gotten close to the Hell Train, and Rachel is at the top of the stairs. Baam has been waiting years to be reunited with his double-crossing traitor of a love interest, well maybe not a love interest now but the whole following her everywhere seemed very much like a love interest thing at the beginning. But he has to fight the mysterious Daniel Hatchid who is part of the Rachel’s team. You may remember him saving Koon Ran from the Mirotic Guardian (the illusionary guardian) who guards the Hell Train before the official time of opening. Daniel Hatchid also seems to be eating something that looks like Yoet, which is a Korean confectionery. Daniel Hatchid seems pretty strong, but Baam’s ability to copy and re-use the moves of opponents throws him off. Baam hasn’t even used the Thorn in this chapter which shows he really has gotten a lot strong, he is somewhat like a monster in his ability to grow. Daniel and Baam end up having a bet, if Baam can defeat Daniel he gets the key to switch off the Mirotic Guardian, and his partner can still go after Yura Ha and get her key if she wishes too. This is more like a one-on-one battle. Meanwhile, the other guys are still battling it out with the Mirotic Guardian and Koon Ran seems to have an idea. Aka and Ran seem to be working together to find their own way past the Guardian. Seems like SIU is trying to pump out more chapters with less content, the beginning of this chapter is the end of the last one with a couple of new pages in between. This is beginning to remind me of how One Piece (the anime) has 2-3 minutes about the previous episode on every episode, which means we end up getting less new content. It also means the chapters will get stretched out, this is something that happened to One Punch Man too. I’m looking forward to the next chapter, there could either be a massive battle or Rachel’s team could escape on the train. Let’s see what happens. 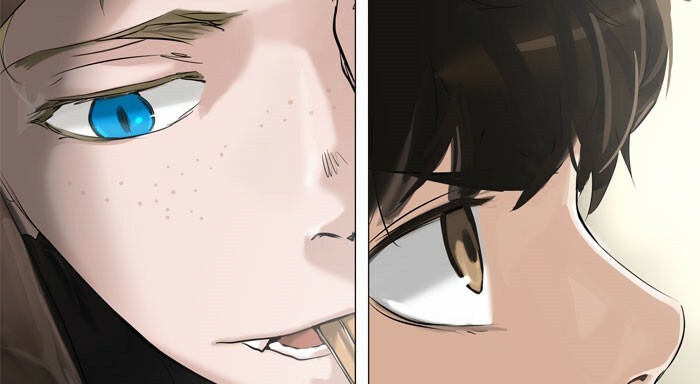 I really hope that Baam and his guys get on the train, what I think would be cool if both Rachel and Baam’s teams get on the train and then they have a large battle. The Hell Train does seem big and it would be cool to see how things go when new participants join the Hell Train as it goes through its various stops.